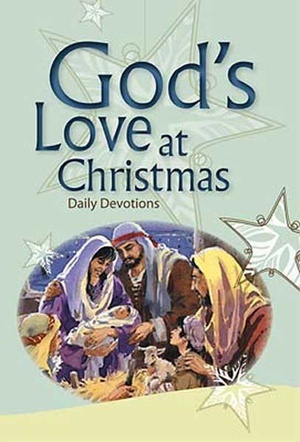 This Advent/Christmas devotional runs from November 27th through Christmas Day, and coordinates with the God's Love at Christmas materials. The Word by whom all things were made has come as a baby made in Mary. The Word who is God and was with God from eternity is born in time. The baby Boy held by His parents is the one who holds you and them and all. This Babe who must be fed by His mother is the Lord who opens His hand and feeds all things. This little Child of lowly birth lying in a manger is the almighty God who is bigger than the entire cosmos. Because of our inbred sin we could not see God and live, but now with God hidden in the pudgy cheeks and tiny hands of this Child we see God and live through Him. Count His fingers and toes, see those hands and feet, and know that God from the moment of our fall wanted to be here. He chose this humble birth. He chose to be conceived and born like us, only without a human father and sin, that He might be the substitute for every sinful moment of our lives. He chose that those hands and feet would grow and then be pierced by nails that bound to our dismal future, that He might bring us through His death and resurrection to His future. He chose to come to our home, that He might make us at home in His father's house. This is love—God choosing to dwell with us because we need Him. There may be days of deep loneliness, heartbreak, or pain, but in Christ Jesus, true God and true man, God is with you in the midst of it all with grace and truth. God loves you dearly. Our apologies, but this item is non-returnable. Concordia Publishing House, where words have been our business and faith our inspiration for more than 139 years. We are the publisher of The Lutheran Church—Missouri Synod, and we are dedicated to spreading the Gospel message of Jesus Christ throughout the world. There are 16 in stock. This item is available for expedited shipping.